In one of the early scenes in the newest Star Trek installment, a world-weary Captain Kirk (Chris Pine) remarks in voiceover how life on the Enterprise has lost some of its luster and how “things feel a bit more episodic” than usual. Whether the comparison was intended or not, this seems to sum up the main issues that stem from Star Trek Beyond as a film and as a part of the rebooted franchise. By the standards of a summer blockbuster, it’s a serviceable sci-fi action outing but it can’t escape feeling like a by-the-numbers effort from a team that’s capable of delivering something much more memorable. We pick things back up with the starship fleet as they undergo a rescue mission on behalf of an alien survivor whom they discover drifting aimlessly in an escape pod. When they arrive at what is supposed to be the remains of the survivor’s ship, it becomes evident that an ambush is afoot and the ensuing damage leaves the Enterprise decimated and its crew separated from one another in different areas of a nearby planet. With limited use of technology and without the resources of their ship, the crew members must reconvene to stop an emerging threat who means to take down the entire Federation. This is the first Star Trek film directed by Fast & Furious alum Justin Lin and the absence of the now Star Wars-focused JJ Abrams is sorely felt here. Lin clearly knows how to put together a competent action scene and even does well with scenes of smaller character interactions but there’s just not the same sense of cohesion and momentum that Abrams developed with the previous two entries. This is most evident in the middle third of the movie, in which Lin attempts to juggle the varying locations and situations but doesn’t manage to pull these transitions off with the kind of kinetic energy that is seemingly secondhand to Abrams. These stranded scenes offer some enticing pairings (Spock and Bones made up my favorite by far) and some that go absolutely nowhere (Sulu and Uhura don’t have nearly enough to do) but in either scenario, we don’t learn much more about the characters that we haven’t learned in previous Star Trek stories. Fortunately, the film finds some fresh blood in the form of a fierce alien scavenger named Jaylah, played by Algerian actress Sofia Boutella. Her tenacity, along with some exceptional costume design and makeup work, contribute to what seems to be the most compelling addition this time around. The same can’t be said for the wonderfully talented Idris Elba, who’s stuck as another generic villain with a bit more of a backstory but not nearly enough in the way of plausible motivation. The biggest reason Into Darkness remains my favorite of this trilogy is because of the intelligence and menace that Benedict Cumberbatch brought to his antagonist and it’s a shame that Elba wasn’t able to do more with his character here as well. 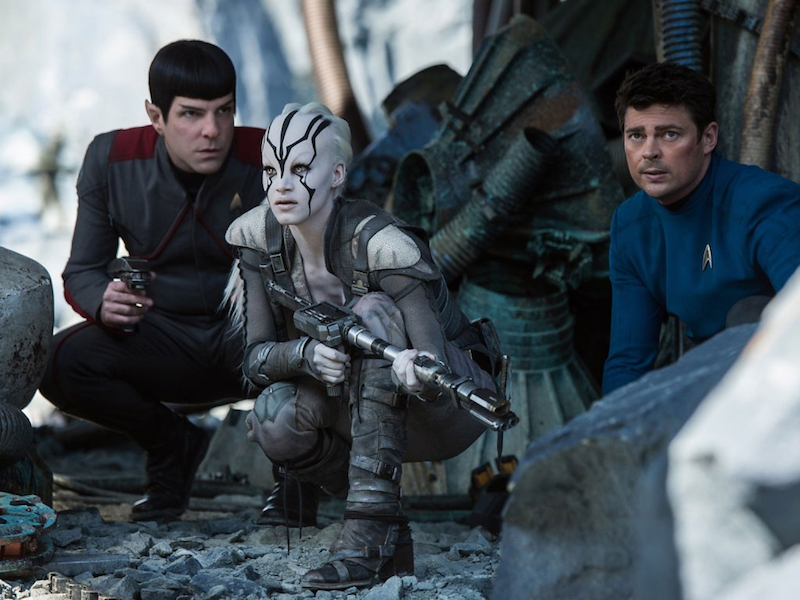 Star Trek Beyond is an ironic title for a film that doesn’t seem terribly interested in moving things forward but those looking for familiar comforts may come out with enough to be satisfied.